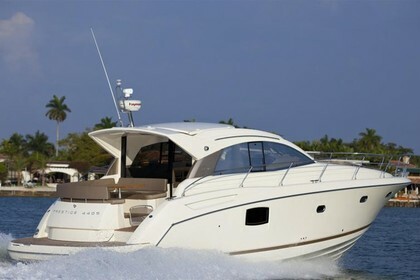 Hakanumatata 3 is a Jeanneau Prestige 440 S. It's from 2011 and is in a mint condition. It has only 220 engine hours. This yacht has 2 big cabines with double berths. It's ideal for two couples. Every cabine has is proper bathroom. On the after deck you have an outdoor kitchen with grill and fridge. There is plenty of room for the ladies to relax in the sun on the after deck. The boat has an double inversed prop and large trimflaps. The 2 Volvo Penta engines delver 740 HP. The boat is now in winterstorage near San Remo.